The start of a series of articles that will delve into the albums of the one, the only Weird Al Yankovic. It all started simply enough. The head honcho of this website, Josh Hathaway, was a guest on my podcast. We were discussing music and what have you, when I made a fairly basic, self-evident statement, not unlike saying "The sky is blue." That statement, boiled down simply: Weird Al Yankovic is an institution. For decades, Weird Al's music has persevered, and he keeps on keeping on, generating new fans with his particular brand of parody and humor based music. His career is fairly unique, and he may just be the hardest working man in show business, now that James Brown is dead. Also, unlike the Godfather of Soul, Weird Al is not an abject creep. During the podcast, Josh broached an idea with me. As I have probably mentioned before in my two other series of essays, I believe that any and all pop culture, no matter how ephemeral or inane or maligned, deserves genuine assessment and criticism. That's why you will find me writing about songs from worst song ever lists and the top songs on the Billboard Hot 100. The idea I previously mentioned as being broached was in this vein. What about Weird Al? Does he and his extensive career lend itself to being assessed in a critical fashion? My answer was, "Of course," and then I got excited about the prospect. I wouldn't consider myself a Weird Al fan, but I am not dismissive of him either. In fact, outside of the realm of his music, I have enjoyed a lot of the stuff he's done, like Al TV and UHF, but I haven't listened to his music all that much in recent years. Like most kids, primarily of the male variety it would seem, I was a fan of his music, and I feel like every generation of child has their Weird Al album everybody has. Mine was Bad Hair Day, featuring the likes of "Amish Paradise" and "Gump." Additionally, my younger brother, who I suppose is the same generation, had Running with Scissors, so I have some familiarity with that as well. I guess what I'm trying to say is I have plenty of familiarity with Al Yankovic and his music, but I haven't given it a ton of thought admittedly. Now, I shall. I intend to listen to every Weird Al album, assess it, and then give my thoughts on it. 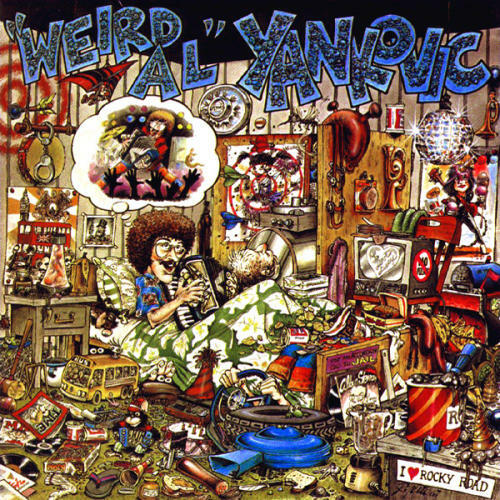 It all began in 1983 with an eponymously titled album, introducing much of the world to Weird Al Yankovic. He had been making music for many years, and had appeared on the radio program of Dr. Demento, one of Bart Simpson's two arch enemies. However, this album was in some ways Weird Al's introduction to the world at large, and fittingly he begins with the song "Ricky." This is apt, since it is not just a parody, but a parody that is about pop culture as well. Building off of Tony Basil's "Mickey," Al's song is sort of a back-and-forth between Ricky Ricardo and his wife Lucy, whom he loves. It's sort of unusual since there is a guest vocalist on the song, legendary voice actress Tress MacNeille, but somebody has to do Lucy, I suppose, while Al does a sort of take on Ricky, which again makes this song somewhat odd since new listeners don't get to hear the true voice of Weird Al in the opener. Aside from that, however, it is a good way to start off the album. Weird Al has been fortunate that "Mickey" has stood the test of time. It was pretty clearly going to be a one hit wonder, former choreographers building songs around cheers don't tend to have long shelf lives, but "Mickey" has persevered. There was less concern about I Love Lucy remaining culturally relevant. Then again, I am viewing this with the benefit of hindsight. As far as Weird Al knew, he might have made even less of a cultural impact than Basil. He just had an idea and ran with it. "Ricky" is a good song, and a strong sign of where Weird Al would go as he develops. The music is fairly limited, which is the case across this whole album. Again, this isn't surprising, given the finances that Weird Al had at this time. It's a fairly lo-fi album, particularly on very early Al songs like "My Bologna" and "Another One Rides the Bus." Of course, a lot of debut albums are venerated after the fact for their sound, but I doubt there are many Weird Al fans who say things like, "You know, I prefer the sound of Al's old stuff." He's not Nirvana, you know? This album does feel like the prototype for Al's records to come (I almost called them Al's albums, but I caught myself because I respect you, the reader). Five of the 12 songs are based on known pop songs. Two of them are about food. While "I Love Rocky Road" is decent enough, "My Bologna" doesn't really hold up. It's a bit too silly and lacks anything all that clever or funny. I know it's a song about bologna, but nevertheless. I want smarter lyrics about deli meat! Weird Al's lyrical style is raw, but his sense of humor remains the same. Part of his broad appeal is that he doesn't really go anywhere crude or vulgar, but he also doesn't usually go for low hanging fruit and lazy jokes. Although, there is a less than stellar song called "Gotta Boogie" about a man with a booger stuck to his finger. I've even heard Weird Al himself way this was, perhaps, not the most impressive of song ideas. There's also some unfortunate sound effect choices, belch sounds, and what have you, and there is a sound I hear throughout the album that seems to be hand farts, but I can't say for certain. However, for the most part Weird Al shoots a bit higher, and has some clever stuff even early on. He's the low culture Tom Lehrer, which is a niche that somebody had to fill, and Al has been the man to do it. Most of the original stuff is, alas, not very good. The jokes don't really land, and the ideas aren't clever enough. He's also not delving out into the bizarre, outlandish concepts he would use on original songs in later albums. The album ends with an odd choice in "Mr. Frump in the Iron Lung," which is basically about Al's friend Mr. Frump, who dies by the end. We occasionally hear the sound of the iron lung working. It falls flat to me. However, my favorite album is also an original, a little ditty called "Happy Birthday." It falls into the category of a cheery song on a, in theory, positive topic, but Al's lyrics mostly focus on the inevitable death of all of us. It's in the vein of songs like "Christmas at Ground Zero," and "Happy Birthday" shows signs of the dark humor that Al only infrequently uses, but does quite well. The musicality is fine. Just your normal accordion stuff. Clearly, Al and his band had some work to do, but they aren't untalented or anything. This was back in the day when Al's singing voice was more nasally and high pitched, but he and his band are already good at making their songs sound like the songs they are aping. Plus, accordions just have a somewhat jovial, silly sound, which is probably why you only hear them on Weird Al records and in polkas, which are only played when doughy Eastern Europeans want to get drunk and dance. However, the most notable thing that occurred to me when listening to Weird Al Yankovic is the fact that I feel a lot of his songs have been miscategorized as parodies. To me, a parody is actively spoofing something. Airplane! is a parody of airplane disaster films because they are actively lampooning those films. The jokes are, in part, based on the films in this genre. Most of Al's songs don't really parody the original it's based off of. "I Love Rocky Road" has nothing to do with "I Love Rock n' Roll." It's just in the style of that song. This isn't a negative, mind you. It's just the way things seem to be. Weird Al mostly just takes a song, thinks of something he can work within the parameters of the song, and then performs it in a similar fashion. It's almost like Al's songwriting style is more puzzle solving than creation. Sure, there is creativity, and he does do originals of course, but Al is more coloring inside the lines than anything. He just colors in the picture in a particularly interesting, unique way. Weird Al Yankovic isn't a good album, admittedly. A couple of the songs aren't very good, the parodies, to the extent they are parodies, are signs of works in progress. It's alright, however. It is a decent listening experience. I got a few laughs, and a few more moments of silent recognition of humorousness, which is what all comedic performers want. A few songs are genuinely good, and at the very least it feels like Weird Al is onto something. His long, storied career speaks to the fact he was. Perhaps by his next album the signs will be even stronger.